The agenesis of a permanent canine  and particularly a missing maxillary canine in a non-syndromic subject are extremely rare. ,,,,, Early diagnosis of ectopic or missing maxillary canines is important. The late detection of ectopic or missing maxillary canines may lead to serious complications. ,, Similarly, with syndromic canine agenesis  early detection and identifying the associated medical conditions is of the essence. 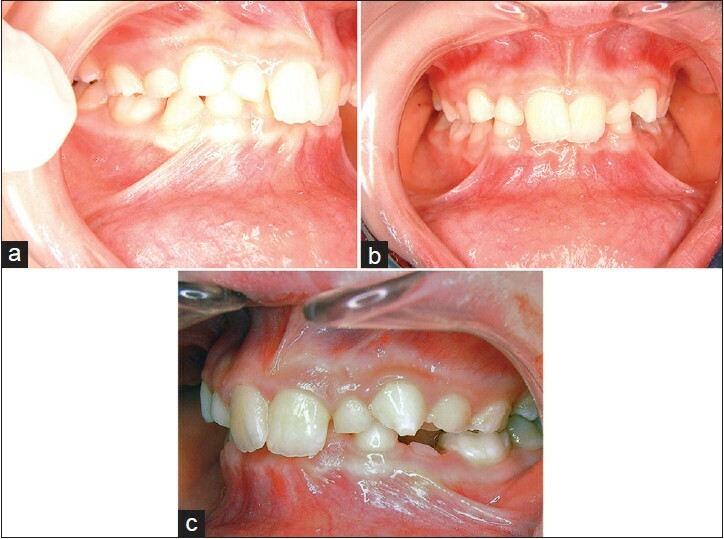 Here, a 10-year-old boy with bilateral maxillary canine agenesis is presented. A 10-year-old boy was referred for an orthodontic examination with a chief complaint of deep bite. Medical history was not contributory. Patient presented with a Class II division 2 malocclusion on a Class II skeletal base. Clinical examination revealed normal temporo-mandibular joint and mandibular movements. Examination revealed no significant facial asymmetry with a convex and a slightly retrognathic profile and reduced lower facial height [Figure 1]. The gingival exposure was normal on smiling. The intraoral examination revealed an early permanent dentition with a deep overbite, overlapping of upper central incisors, and retained deciduous maxillary lateral incisors and canines, as well as retained deciduous molars [Figure 2]a-c. Oral hygiene was fair, and caries was absent. Radiographic examination revealed the absence of permanent maxillary lateral incisors, canines, and the right second premolar [Figure 3]a. In the mandibular arch, both second premolars and lower left lateral incisor were absent [Figure 3]a. The decision was made to review the patient and to assess the prognosis of retained deciduous teeth. Meanwhile, it was decided to liaise with various experts to develop a definitive treatment plan. 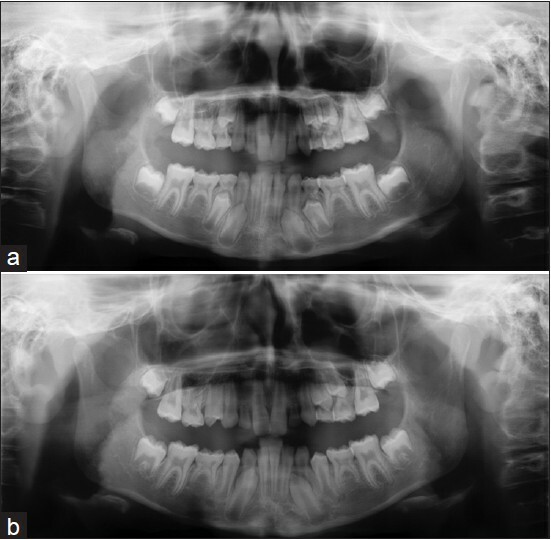 The patient was reviewed for approximately 18 months, and consecutive panoramic view showed some degree of progressive root resorption in deciduous mandibular molars and maxillary lateral incisors [Figure 3]b. The maxillary deciduous canines displayed no root resorption in the initial and consecutive radiographic examinations [Figure 3]a and b. It was also noted the subject's siblings suffered from a mild form of hypodontia. Hypodontia is seen with many syndromes, but most frequently with X-linked ectodermal dysplasia. , Oligodontia may be associated with other ectodermal abnormalities and syndromes, and consequently, treatment of these patients needs a multidisciplinary approach. , Nearly 15% of patients missing eight or more permanent teeth were affected with a syndrome such as ectodermal dysplasia;  the isolated form of oligodontia has been associated with mutations in EDARADD, AXIN2, MSX1, and PAX9 genes. The isolated agenesis of maxillary permanent canines has been associated with mutations of WNT10A gene. There are indications that the incidence of permanent canines agenesis is higher in females, and it commonly affects the maxilla, in particular the left side. ,, Considering the rare and unusual pattern of hypodontica, there was some suspicion this child may have some associated medical conditions (i.e. variant of ectodermal dysplasia). Therefore, a medical geneticist was asked to evaluate the patient. The result of medical examination; however excluded this. In the mandibular arch, deciding whether the occlusion sets up properly with three mandibular incisors is important, which is determined by assessing the tooth size relationships between maxillary and mandibular incisors. At the end of treatment, some increased overjet would be unavoidable due to the present tooth size discrepancy. In the mandibular arch, establishing whether extraction of the mandibular second deciduous molars results in permanent molars shifting forward to take up space for missing second premolars is critical. This is determined to a great degree by the patient's overall skeletal pattern. With a steep mandibular plane, teeth will drift forward more easily;  analyzing the patient's radiographic cephalogram determines that. It is advisable to keep in mind the overall goal of trying to reduce the number of teeth that eventually needs to be replaced. Within this context, the uses of mini-implants  help in mesialization of maxillary and mandibular dentition, space closure, and premolar substitution. A treatment plan to extract the maxillary deciduous lateral incisors, maxillary left deciduous second molar and deciduous mandibular second molars as well as orthodontic space redistribution was formulated. It was suggested to provide 3 implant-supported restorations in maxillary lateral incisors and maxillary right first premolar areas, after completion of facial growth. Deciduous canines showed a good survival rate; however, the life span of deciduous molars was not promising. Considering the age and remaining growth potential for this patient, it was decided to keep deciduous canines and eventually replaced them with implants. In summary, agenesis of permanent canines is often part of a bigger picture, including severe hypodontia and associated medical problems. The ability to predict the long-term prognosis of retained deciduous teeth without permanent successors would be of considerable value. In a multi-stage restorative therapy many factors should be considered such as the early diagnosis of agenesis, associated medical problems, patient's malocclusion and facial skeletal pattern, life span of deciduous teeth, minimum number of required prosthetic units, patient's preferences, and the treatment cost. Schalk-van der Weide Y, Steen WH, Bosman F. Distribution of missing teeth and tooth morphology in patients with oligodontia. ASDC J Dent Child 1992;59:133-40. Sarnäs KV, Rune B. 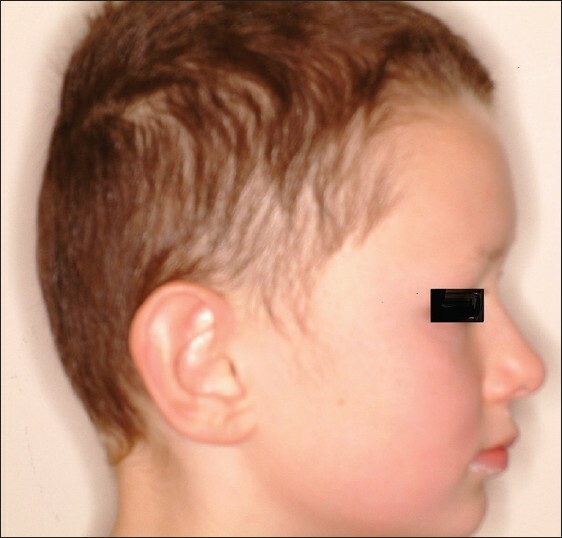 The facial profile in advanced hypodontia: A mixed longitudinal study of 141 children. Eur J Orthod 1983;5:133-43. Schalk-van der Weide Y, Beemer FA, Faber JA, Bosman F. Symptomatology of patients with oligodontia. J Oral Rehabil 1994;21:247-61. Bergendal B, Bergendal T, Hallonsten AL, Koch G, Kurol J, Kvint S. A multidisciplinary approach to oral rehabilitation with osseointegrated implants in children and adolescents with multiple aplasia. Eur J Orthod 1996;18:119-29. Nodal M, Kjaer I, Solow B. Craniofacial morphology in patients with multiple congenitally missing permanent teeth. Eur J Orthod 1994;16:104-9. Cobourne MT. Familial human hypodontia - is it all in the genes? Br Dent J 2007;203:203-8. Symons AL, Stritzel F, Stamation J. Anomalies associated with hypodontia of the permanent lateral incisor and second premolar. J Clin Pediatr Dent 1993;17:109-11. Brook AH, Elcock C, al-Sharood MH, McKeown HF, Khalaf K, Smith RN. Further studies of a model for the etiology of anomalies of tooth number and size in humans. Connect Tissue Res 2002;43:289-95. Rózsa N, Nagy K, Vajó Z, Gábris K, Soós A, Alberth M, et al. Prevalence and distribution of permanent canine agenesis in dental paediatric and orthodontic patients in Hungary. Eur J Orthod 2009;31:374-9. Keniry AJ. Congenital absence of permanent maxillary canines. A case report. Dent Pract Dent Rec 1965;16:133-4. Hillam DG. Congenital absence of permanent maxillary canines. Dent Pract Dent Rec 1970;20:268-70. Lum YM, Lim ST. Four cases of congenitally missing permanent cuspids. Singapore Dent J 1976;2:49-51. Leong P, Calache H. Bilateral congenitally missing maxillary canines. A case report. Aust Dent J 1999;44:279-82. Cho SY, Lee CK, Chan JC. Congenitally missing maxillary permanent canines: Report of 32 cases from an ethnic Chinese population. Int J Paediatr Dent 2004;14:446-50. Lombardo C, Barbato E, Leonardi R. Bilateral maxillary canines agenesis: A case report and a literature review. Eur J Paediatr Dent 2007;8:38-41. Ericson S, Kurol J. Incisor resorption caused by maxillary cuspids. A radiographic study. Angle Orthod 1987;57:332-46. Power SM, Short MB. An investigation into the response of palatally displaced canines to the removal of deciduous canines and an assessment of factors contributing to favourable eruption. Br J Orthod 1993;20:215-23. Rimes RJ, Mitchell CN, Willmot DR. Maxillary incisor root resorption in relation to the ectopic canine: A review of 26 patients. Eur J Orthod 1997;19:79-84. Stanley HR, Collett WK, Hazard JA. Retention of a maxillary primary canine: Fifty years above and beyond the call of duty. ASDC J Dent Child 1996;63:123-30. Proffit WR, Fields HW, Sarver DM. Contemporary Orthodontics. 4 th ed. St. Louis: Mosby; 2007. p. 234-67. Cooke J, Wang HL. Canine impactions: Incidence and management. Int J Periodontics Restorative Dent 2006;26:483-91. Bishara SE. Impacted maxillary canines: A review. Am J Orthod Dentofacial Orthop 1992;101:159-71. Fox NA, Fletcher GA, Horner K. Localising maxillary canines using dental panoramic tomography. Br Dent J 1995;179:416-20. Ferguson JW. Management of the unerupted maxillary canine. Br Dent J 1990;169:11-7. Haselden K, Hobkirk JA, Goodman JR, Jones SP, Hemmings KW. Root resorption in retained deciduous canine and molar teeth without permanent successors in patients with severe hypodontia. Int J Paediatr Dent 2001;11:171-8. Lidral AC, Reising BC. The role of MSX1 in human tooth agenesis. J Dent Res 2002;81:274-8. Worsaae N, Jensen BN, Holm B, Holsko J. Treatment of severe hypodontia-oligodontia - an interdisciplinary concept. Int J Oral Maxillofac Surg 2007;36:473-80. Bergendal B, Klar J, Stecksén-Blicks C, Norderyd J, Dahl N. Isolated oligodontia associated with mutations in EDARADD, AXIN2, MSX1, and PAX9 genes. Am J Med Genet A 2011;155A: 1616-22. Kantaputra P, Kaewgahya M, Kantaputra W. WNT10A mutations also associated with agenesis of the maxillary permanent canines, a separate entity. Am J Med Genet A 2014;164A: 360-3. Fukuta Y, Totsuka M, Takeda Y, Yamamoto H. Congenital absence of the permanent canines: A clinico-statistical study. J Oral Sci 2004;46:247-52. Borzabadi-Farahani A. Orthodontic considerations in restorative management of hypodontia patients with endosseous implants. J Oral Implantol 2012;38:779-91. Borzabadi-Farahani A, Zadeh HH. Adjunctive orthodontic applications in dental implantology. J Oral Implantol 2013, doi: 10.1563/AAID-JOI-D-13-00235. Mazor Z, Peleg M, Redlich M. Immediate placement of implants in extraction sites of maxillary impacted canines. J Am Dent Assoc 1999;130:1767-70. Bolton WA. The clinical application of a tooth-size analysis. Am J Orthod 1962;48:504-29. Houston WJ. Mandibular growth rotations - their mechanisms and importance. Eur J Orthod 1988;10:369-73. Kanomi R. Mini-implant for orthodontic anchorage. J Clin Orthod 1997;31:763-7.